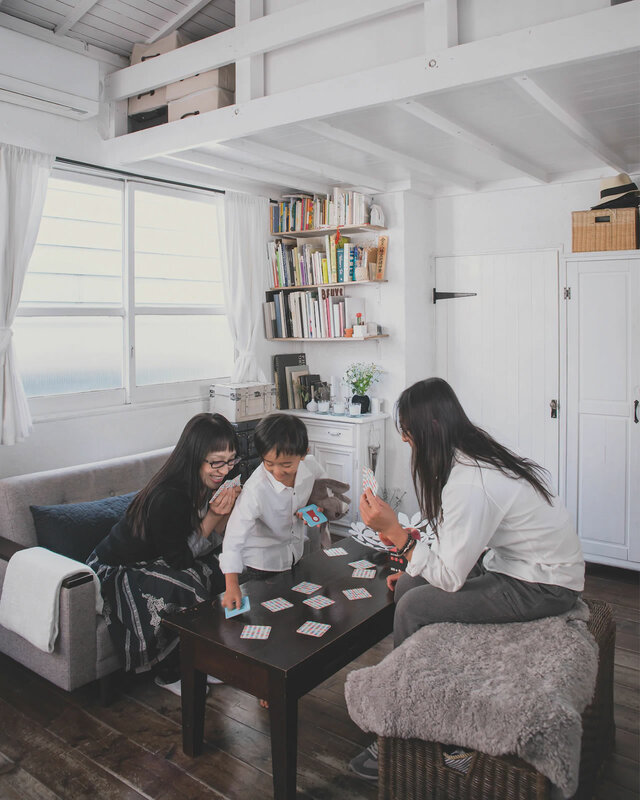 Kaoli and Shige live with their 6-year-old son Tokiwa in a house that’s just 25m2. Think that sounds tricky? 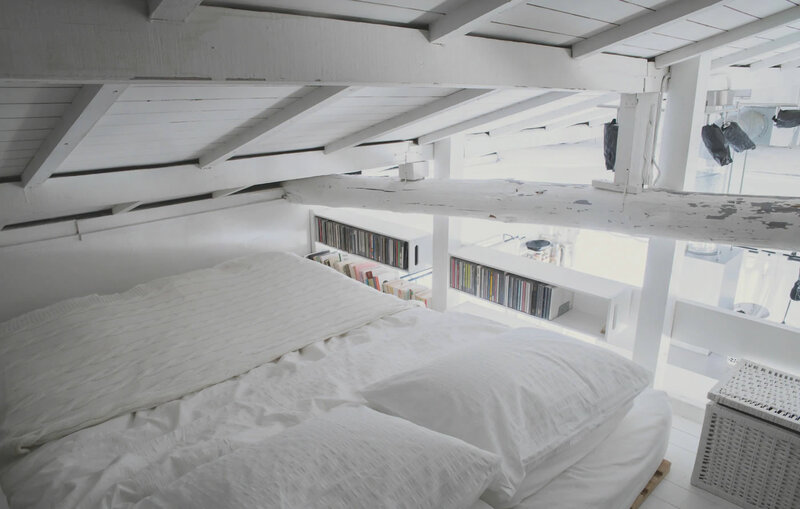 Good habits, an all-white palette and clever storage make it work. "Our life is here. Each day starts with happy feelings, and ends with tranquillity. It’s a space united by color and family: happy, natural, pure." Kaoli and Shige’s home was planned around a simple concept: to be as white and natural as possible, like the white chrysanthemum Matricaria after which it is named. "We never compromise on the concept," says Kaoli. "Before buying anything, we always think, will this suit Matricaria?" 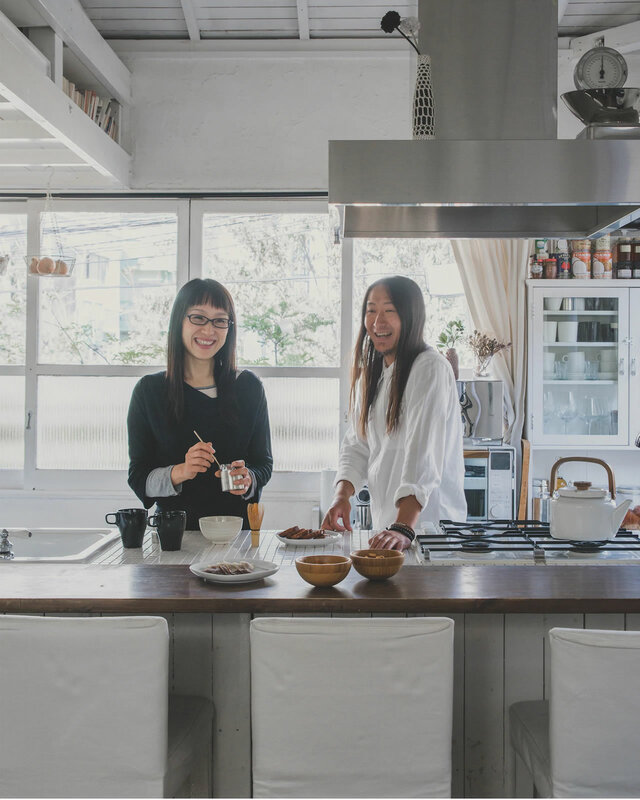 The kitchen island is at the centre of their life at home; it’s where Kaoli holds cooking lessons with Tokiwa and the three of them eat meals side-by-side at the breakfast bar. Kaoli and Shige sleep on a mattress in the loft, their wash area leads off from their galley kitchen and they play games around the coffee table. And that suits them just fine. 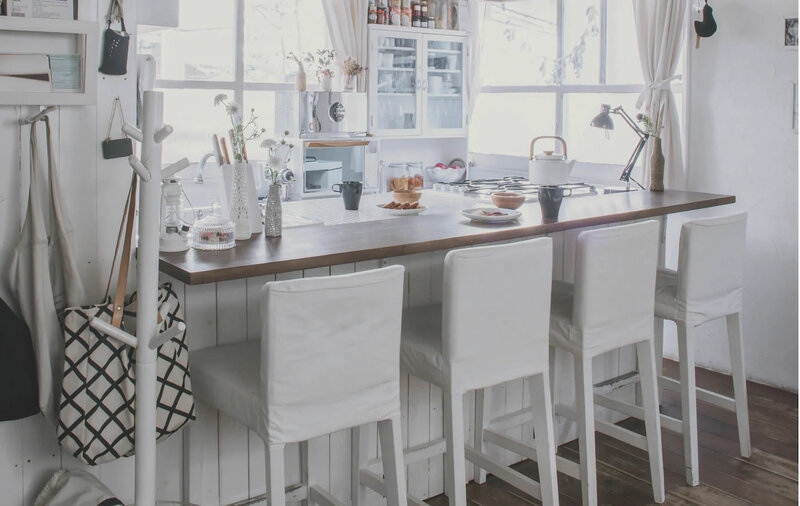 "Thanks to all the white, it’s a really bright space," says Kaoli. "So it feels relaxing, and bigger than it actually is." 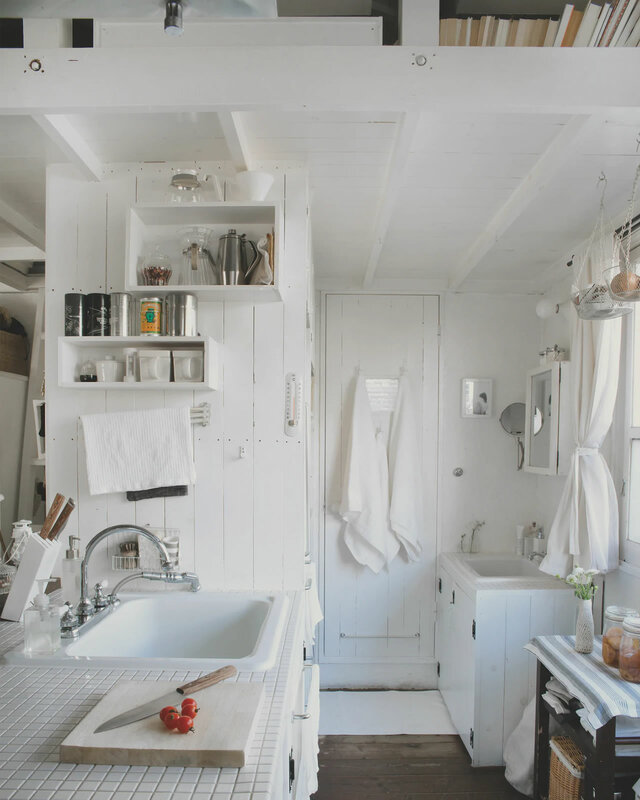 Amongst all the white, there are heaps of almost imperceptible storage ideas, from simple solutions like hanging towels on the back of doors and looping tea towels through cupboard handles, to piling vegetables in baskets hanging from the ceiling and using wall-mounted open shelves. ‘I love Shige’s handmade shelves – they’re the perfect fit for my coffee-making equipment.’ The mirrored bathroom cabinet reflects light, making the space feel bigger, and the area under the countertop sink is a sensible place to put cleaning products. "We have to use our space efficiently, so I carry around a notepad with our apartment’s measurements to know whether a piece of furniture will fit or not." Not one centimetre of wasted space. "Everything has to have its space and place in our home," says Kaoli. That means it not only has to be made from natural materials, but also fit into its spot exactly. 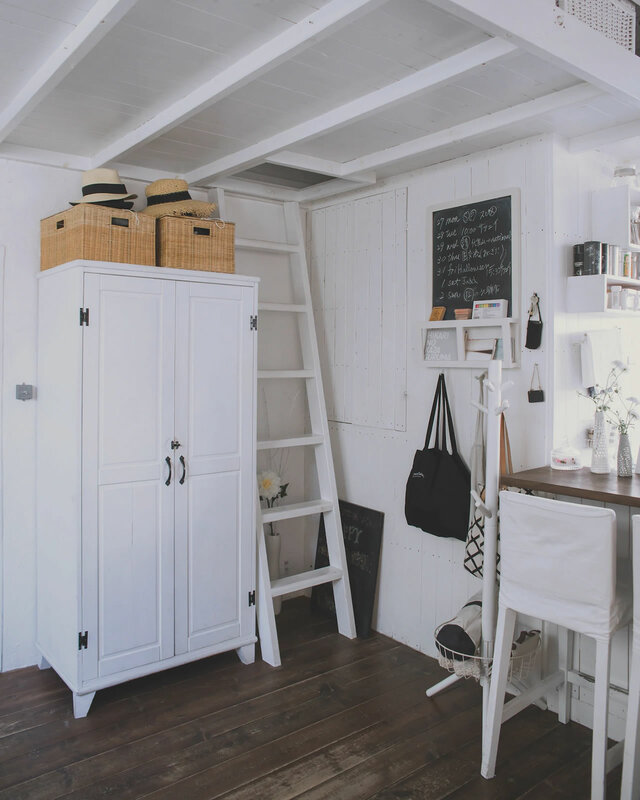 Take their wooden wardrobe – they liked its simplicity and size, but it wasn’t white – so Kaoli painted it, and added rattan storage boxes on top. She has a rule that if new clothes won’t fit in it, then she can’t buy them. "With organised storage, we never run out of things and we never buy too much." Furniture has to work twice as hard in Kaoli’s home. Her coffee table is where they play cards, eat with friends and watch films on their laptop, using a storage box covered with a sheepskin throw as an extra seat. "Other children often come round to play, but we also love quiet time as a family, just the three of us!"